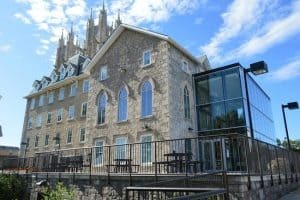 Guelph and the surrounding Wellington County is a wealth of things to do and places to explore. Even locals often haven’t seen everything there is to see! Fall is a great time to get out to take a look around. As the weather cools it becomes the perfect temperature to head out on a day trip around the county to see how great our little corner of Ontario really is. It’s also a great time to gather up some friends or get a community group together for a group trip! Here’s some of our top suggestions for things to do and areas to explore around Guelph this fall. This interactive farm market and winery welcomes bus tours from all around the area, and is only 35 minutes from Guelph! On site you can pick your own seasonal fruit, visit the animals, taste some fresh wine produced on site, have some ice cream and let the kids to play on the playground. You can easily spend the whole day here checking everything out, so a group bus trip would be a great way to experience all the farm has to offer. Elora is a small community in Wellington that is well known for it’s 19th-century limestone architecture and the nearby Elora Gorge. Spend some time walking around town then head to the gorge for a swim, boat ride or just to take in the views. Along the edge of the gorge you’ll find riverside trails and scenic overlooks that offer nice places to stop for a break, a bite to eat or a photo op. See if you can spot some kayakers in the rapids! On October 7, 2018 the Elora Farmers Market hosts their annual Pumpkin Day where you can enjoy pumpkin carving and judging, pumpkin flavoured ice cream, games, kids activities and live music. Did you know Switzer-Carty Transportation is now in Wellington County? Our Guelph operations provide school bus and private bus trip services and would be happy to take YOUR group on it’s next group trip. Let’s explore together! The Arboretum at the University of Guelph is home to more than 2000 different kinds of trees on over 400 acres of woodlands, wetlands and meadows. If you’re looking to experience the beauty of fall, this is a great place to do it! Bring a book and a snack and enjoy great outdoors on the many walking trails and in the beautiful gardens. The best part is it’s free to enter! Enjoy a pancake breakfast, feast of a lunch and all-day offerings of apple butter and cider at this festival. Wander the village and take in the markets, performances and entertainment. This long-running community fair showcases local agriculture, community exhibits and family entertainment. Take your group on a self guided tour to several Wellington area farms, markets and food businesses for the chance to get up close and personal with your food. Meet local farmers, learn about their farms, and taste some local goodness. This is the perfect excuse to hire a bus and enjoy a relaxing day in the countryside! What is fall fun with friends without an Oktoberfest to attend?! This is the second largest German festival in the entire world, so it’s definitely worth a visit! If there ever was the perfect event to arrange a group bus trip to, this would be it! Gather your friends and fellow art enthusiasts and take a self-guided tour around Elora and Fergus. You’ll meet artists and crafters who open their doors for sales, demonstrations and showings. Explore Stratford’s historic downtown and meet artists of all kinds on this self-guided tour. Located just outside of the GTA, Guelph and Wellington County are great areas to escape to when trying to get a break from city life. There is so much to do no matter the season!